I am a federal wildlife biologist who contracted Lyme disease in the state of Montana while working. I was misdiagnosed for over 3 years and had to travel out of state for adequate testing and care (which is not a rare story in this state or others). I am currently on sabbatical due to a serious relapse this past spring. 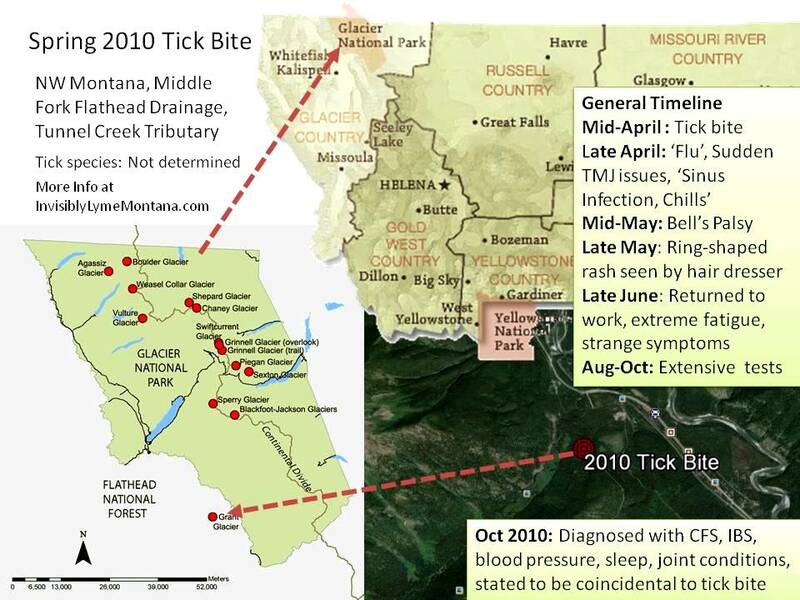 I was bit by a tick in April 2010 in the Middle Fork Flathead River drainage on the Flathead National Forest, near Glacier National Park. It was the Paola/Tunnel Creek area on a unit of the Middle Fork Fuels Reduction Project (a unit that was subsequently dropped for wildlife concerns). Lyme. I had also heard from FS Lyme patients and their safety officers from across the country who wanted my safety officer to know that the Flathead had a donated leave recipient/patient they were sure had Lyme disease. I saw a Lyme Literate doctor in Washington and received more accurate testing (typical two tiered testing is horribly inaccurate, if patients are even tested here in the first place). I did not test ‘CDC-surveillance-positive for new-onset infection’ but I certainly wouldn’t have expected to after three years, and surveillance criteria were never intended to be used diagnostically (but unfortunately very commonly are). In addition to overwhelming clinical evidence, I did test positive for multiple Lyme-specific bands. And multiple others were present in lower or less determinate concentrations. I kept working through treatment (maybe not what I’d advise other patients to do, but I wanted to and felt I could) for about a year (pretty intense antibiotics) and was maintaining well by last winter. By spring 2014, I suddenly wasn’t coping well physically again to stressful stimuli and symptoms started returning (they hadn’t all gone away but I had made tremendous progress). I had to leave work when things went downhill faster and faster. My employer arranged for a year of extended leave, which lasted through mid May 2015 (next week). To be continued…..
Agency websites so far state it is not here, but this is pending a first case. However, until a first case is documented, those of us that contracted our illness here will not be considered to be Lyme cases. Since we do not get diagnosed quickly, we no longer meet surveillance criteria when we do test positive and/or are clinically diagnosed (in most cases) making the absence of ‘dots’ on CDC surveillance maps very misleading. Many patients are experiencing what I have experienced, as far as contracting Lyme here but having to leave the state for diagnosis and care. Patients that move here with Lyme typically cannot find care here, or at least not easily, due to lack of doctor experience and education (and in many cases a pervasive belief that Lyme does not persist beyond short term antibiotic treatment). More and more residents I talk to locally know someone with Lyme and/or know someone that contracted Lyme here in Montana. Patients are very infrequently tested here, and the two tiered testing strategy recommended in current treatment guidelines are incredibly inaccurate (false positive rates are around 65% if and when tests are administered during the right window of time, which is not what usually occurs—at least one study shows false negatives as high as 85%). Lack of deer ticks is the primary rationale for precluding diligent consideration of Lyme disease, despite the lack of supporting survey effort and the fact that additional species (both hard bodied and soft bodied) transmit Lyme to humans. Many or most of the patients that contracted Lyme in Montana didn’t think Lyme was present here and trusted their doctors for at least a year (thought the average seems to be 2-3 years).